In Q2 2018, the continuity of financial deleveraging and trade frictions with the US moderated China’s GDP growth to 6.7% y/y from 6.8% y/y in the previous quarter. 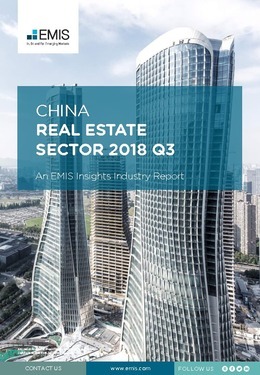 Due to robust transactions in central and western China, sales of commodity housing registered a 13.2% y/y growth during the first half of 2018 compared to 10.4% y/y growth during the first three months of the year. The buoyant home sales pushed up housing price even as restrictive measures, including limits on housing purchase, mortgage, selling price, and reselling, have been resolutely implemented by both central and local government to stabilise the real estate market. NBS data suggested that in June 2018 the prices of newly constructed commodity residential buildings increased m/m in 63 cites out of 70 cities monitored by the authorities. This figure marked the fourth consecutive monthly acceleration and is the highest number in the past 22 months. Tier-2 and tier-3 cities registered the highest price increases of 6.3% m/m and 6% m/m respectively. This report provides a complete and detailed analysis of the real estate sector for [country name] . EMIS Insights presents in-depth business intelligence in a standard format across countries and regions, providing a balanced mix between analysis and data.